In the morning of November 21st, Hanoi, the Committee for Ethnic Minority Affairs associated with the Embassy of Republic of Ireland and United Nations Entity for Gender Equality and the Empowerment of Women (UN Women) launched the “Sharing the investigation's result of the socio-economic situation of 53 ethnic minority groups in 2015 from the expert view” Conference. Having the authority of CEMA’s leader, Mrs. Nguyen Thi Tu, the Director General of The Department of Ethnic Minorities together with Mrs. Cáit Moran, Ambassador Extraordinary and plenipotentiary of Republic of Ireland in Vietnam & Mrs. Elisa Fernandez, Head of UN Women office in Vietnam hosted the Conference. There are the representatives of Committee of Social Issues, National Council (of National Assembly); some Central Ministries, agencies; representatives of 14 provinces, cities and some Departments, units belong to CEMA along with experts in gender equality. At the present, gender inequality in mountainous and ethnic minority area still has inadequacies which need to solve, including women in ethnic minority community has weaker role in family, community, society. They are facing many difficulties from their circumstances, living environment as well as cultural barriers leading to low interests. The result of data analysis from the investigation of socio-economic situation of 53 ethnic minority groups in 2015 shows the between two genders in ethnic minority groups as well as between ethnic minority groups and Kinh is large and existed in many socio-economic fields: education, jobs, ability to live another place, access to financial services, resources and production experience, approach to the market, etc. Speaking at the Conference, Mrs. Nguyen Thi Tu said: to achieve the millennial goals, especially the gender equality goal in ethnic minority area which is hard to solve since woman and children have to face the inequality, poverty, diseases, etc. everyday. The goal of Conference is to share the result from the investigation of socio-economic situation of 53 ethnic minority groups in 2015 from expert view to have a better solution to reach the gender equality goal in ethnic minority area. Also, in the conference, Mrs. Cáit Moran shared: Vietnam and Ireland had 10 years working together in developing ethnic minority area. However, this area still has many difficulties, ethnic minority people have many barriers, especially ethnic minority women who suffer many disadvantages. Ireland will undertake to associate with Vietnam in building specific policies, plans and programs to bring the equality and develop women, especially ethnic minority women. Mrs. Elisa Fernandez, Head of UN Women office in Vietnam congratulated CEMA in particular, Vietnam in general on the achievements involved women in ethnic minority groups. However, these programs not solve all the inequality of ethnic minority women. Vietnamese Government needs to invest resources, come up with solution to ensure a better development for ethnic minority women. UN Women will continue to support Vietnam to make sure that ethnic minority women can equal participate in every fields. 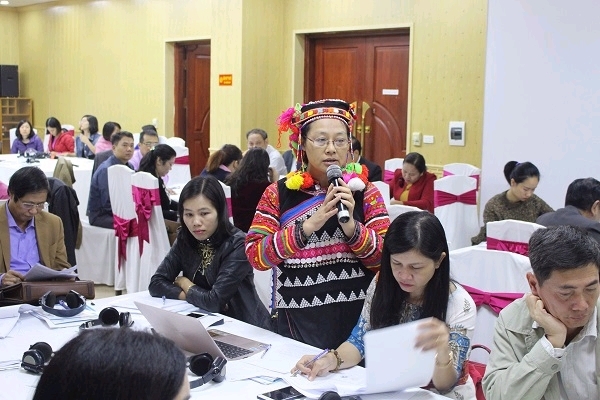 At the Conference, the representatives together exchanged results of the data analysis Report in planning ethnic policy related to gender equality in ethnic minority area. Furthermore, the representatives found solutions to increase the chance of development for women and girls in ethnic minority community. Some of the solutions are: increasing the role of multi-media to eliminate the preconception; increasing the resources; helping ethnic minority women by providing an access to market, jobs, etc. At the conference, the representatives also heard the draft of National Scheme supporting activities related to gender equality (term 2018-2020) and discussed about the proposal of detail plan to execute this Scheme.